Home > Membership > Nonprofit World > Do You Have a Policy for Real-Estate Gifts? 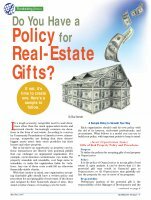 Do You Have a Policy for Real-Estate Gifts? If not, it's time to create one. Here's a sample to follow.